In the decades after World War II, the U.S. government and licensees dumped tens of thousands of containers of radioactive waste at dozens of dump sites in the Pacific and Atlantic oceans, often sealed in stainless steel drums that were expected to eventually deteriorate. A Journal review of federal and other records shows there are questions about the exact locations, contents and condition of waste containers, along with concerns about potential threats to the environment and public health if seafood gets contaminated. Federal officials say that testing done over the years hasn’t produced evidence of harm. Over the years, federal officials have put the number of dump sites at from 29 to more than 60, with the vast majority of waste going to a handful of locations. (Some sites may have been designated without ever being used.) 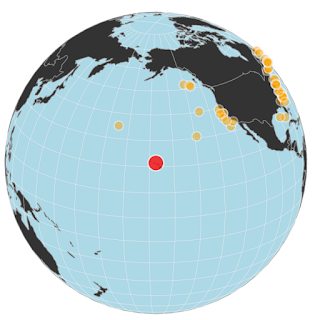 In 1980, the Committee to Bridge the Gap, an environmentalist group, assembled a list of 50 offshore nuclear dump sites, with specific coordinates for each site. Learn more by browsing the interactive graphic below and reading the accompanying story. Heres the thing..the concentration of radionuclides put in the ocean pales in terms of the concentration of natural radioactivity in the ocean already. We need K40 to live, its an important cellular signalling device. The manmade stuff is killing the ocean though.